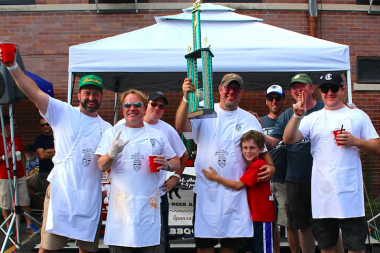 The 2015 beer/BBQ pairing champs: Off Color Brewing and Los Banditos Guajillos, who smoked up ancho crusted pork. OLD IRVING PARK — Eighteen teams of brewers and pitmasters will compete for bragging rights at Saturday's Beer & BBQ Challenge. The real winners? Attendees, who get to sample all of the brews and smoked meats. The barbecue is serious business, even if pun-happy team names, like Inglorious Basters, suggest otherwise. Come hungry for samples of deep-fried pulled pork fritters and meatballs, barbecue waffles and "A Bollywood Dance Number in Your Mouth" — pork flavored with traditional Indian spices and served on naan. Tickets are $55 and can be purchased online. The price includes one food sample from each team, a beer pairing for each, and one additional beer offering per team. The cost of admission also earns attendees the right to cast a vote for best beer, best barbecue and best pairing. VIP tickets are available for $80 and include all of the above, plus an extra hour of sampling. Celebrity judges will also weigh in on best barbecue. This year's panel of experts: Rob Levitt from The Butcher & Larder, Barry Sorkin of Smoque BBQ and Kevin Corsello from Pork & Mindy’s. The Beer & BBQ Challenge takes place 1-5 p.m. Saturday, St. Viator parking lot, 3644 N. Kedvale Ave. Proceeds benefit St. Viator Elementary School and parish. Get a fly new summer wardrobe â stop by our resale sho@_MercyBeaucoupup in Old Town this weekend!